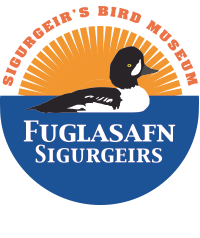 Sigurgeir´s Bird Museum was opened at it´s current location, by Lake Myvatn, in 2008. The collection is the work of the late Sigurgeir Stefansson, who was an enthusiastic birder and nature lover. His dream was to open a bird museum for birdwatchers but also for educational purposes. Sigurgeir died at the age of 37 in a tragic accident at Lake Myvatn, but his family turned his dream into reality 9 years later. The museum houses around 180 different specimens and covers all Icelandic breeding species apart from the rare Red Phalarope. We offer traditional refreshment, like hot-spring baked rye bread with smoked trout and flat bread with smoked lamb, at our restaurant. Once a day at 14.00 birders meet at the museum to share their experiences of the day. In our area 57 different breeding species have been seen and the Lake Myvatn area has the highest number of different species of ducks in the world. On one of the small islands at the lake we have a camera which can be viewed on a monitor from within the museum. To name some of the ongoing research activities in which we participate, every Monday is a counting day for Whooping Swans in the area and we also monitor the egg laying of species like the Horned Grebe etc. At the museum we also have multimedia information about the birds and birdwatching.